Whether you have an exact idea of the interior or exterior door you're looking for, or you'll know the right one "when you see it", working with Simpson to find the right door for you makes the process simple. Any Wood- Select the spiecies that fits you; from traditional to exotic. Any Size- Our doors come in all shapes and sizes. Glass Options- Available in a variety of textured and obscure. Caming Choices- (The dividers in glass) offered in silver, black, or brass. Privacy Rating- Let the world in, or choose to be private. In addition to their enormous range of options in wood, or wood and glass exterior doors, Simpson has developed technology for exterior doors that are subject to harsher environments. Their Performance Series® delivers maximum protection of your finely crafted Simpson door and is offered in two options; UltraBlock® and WaterBarrier™ Technologies. 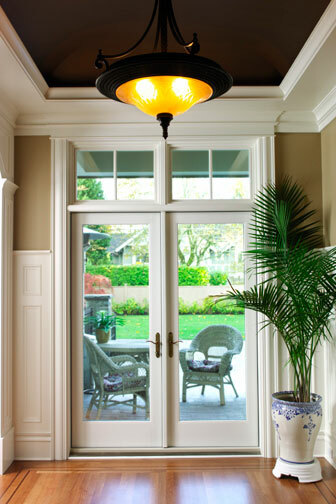 The combination of these two technologies creates a door sited for the toughest exposures without sacrificing the charm and craftsmanship from a Simpson door. Long a favorite of Simpson's most discriminating customers, UltraBlock technology features a composite block in the bottom of the stiles, where water infiltration typically occurs. Their exclusive Weather Seal™ process provides additional protection against moisture penetrating the bottom rail. It's Simpson's version of the galoshes you splashed around in as a kid! Available on select French doors, WaterBarrier technology combines a Medium Density Overlay (MDO) with PVC glazing bead to create an exterior that stops water in its tracks and an entry door that gives you the best of both worlds; water-protection on the outside, and unmatched beauty of a real wood door on the inside. It's a perfect alternative to an expensive cladded door, and exactly the type of innovation you'd expect from Simpson. From a two-panel or pantry-etched door to a full glass French Door, Artist® Collection, or one-of-a-kind custom door, Simpson is where you can begin choosing your next interior door. No matter what attribute you've envisioned, Simpson will create the exact wood door for you.